Structural Fracture Mechanics  is the field of structural engineering concerned with the study of load-carrying structures that includes one or several failed or damaged components. It uses methods of analytical solid mechanics, structural engineering, safety engineering, probability theory, and catastrophe theory to calculate the load and stress in the structural components and analyze the safety of a damaged structure. There is a direct analogy between Fracture Mechanics of solid and Structural Fracture Mechanics. There are different causes of the first component failure: 1) mechanical overload, fatigue (material), unpredicted scenario, etc. 2) human intervention like unprofessional behavior or a terrorist attack. A. A localized failure does NOT cause immediate collapse of the entire structure. B. The entire structure fails immediately after one of its components fails. If the structure does not collapse immediately there is a limited period of time until the catastrophic structural failure of the entire structure. There is a critical number of structural elements that defines whether the system has reserve ability or not. Safety engineers use the failure of the first component as an indicator and try to intervene during the given period of time to avoid the catastrophe of the entire structure. For example, Leak-Before-Break methodology means that a leak will be discovered prior to a catastrophic failure of the entire piping system occurring in service. It has been applied to pressure vessels, nuclear piping, gas and oil pipelines, etc. The methods of Structural Fracture Mechanics are used as checking calculations to estimate sensitivity of a structure to its component failure. The failure of a complex system with parallel redundancy can be estimated based on probabilistic properties of the system elements. The model  supposes that failure of several elements causes neighboring elements overloading. The model equation (1) shows the relationship between local and external stresses. Here q is overload factor (typical value is 0.1 - 0.5) and b is the scale parameter of the Weibull distribution. The equation (1) is similar to the cusp catastrophe behavior. The theory predicts reserve ability of the complex system and the critical external stress. Comparative analysis (the comparison of new and existing structures) is an efficient design tool. Historical data and a designer's personal experience are crucial in making decisions about the design of a structure. The principal role of fracture mechanics is to show the mechanism of failure as well as its determining factors, environmental effects, and possible catastrophic failure prevention techniques. Such analysis is qualitative in many practical cases. Finite element analysis, the estimation of fatigue crack growth characteristics, graphical representation, and multi-criteria calculations help the designers optimize new structures. The absolute estimation of lifetime N1 is based on knowing external load P(t) and the standard mechanical properties (for example, the Paris' equation coefficient and exponent C, n). The characteristics obtained by standard specimens can be used if 1) there is a similarity between fracture mechanisms; 2) load schemes for the main failure scenario of the structure and the standard test are similar; or 3) the result is known in advance as conservative. The values of lifetimes N1 and N2 are compared for relative estimation. If the absolute estimation of lifetime Ni includes essential errors then the relative estimation is more reliable. The relative estimation is useful for the decision-making process in many practical cases. If a structure is in service or has undergone full-scale tests, then the results can be used to predict the lifetime of a similar structure. The designer can use the properties of 'material + loading scheme + fracture mechanism' for structure 1 instead of data of the standard mechanical properties. This allows the designer to obtain a more reliable estimation owing to the similarities among fracture mechanisms, models, and loading schemes. Factor analysis includes the comparison of factors determining structural integrity, failure mechanisms, and lifetime for two or more variants of a structure. It is possible to obtain a quantitative evaluation if main the factors (e.g. maximal stresses, characteristics of cyclic crack resistance and others) are similar. If some factors are different they can be considered based on their effects on structural integrity. The result of the factor analysis is an expert comparative analysis, for example: explaining which structure has the longer lifetime. The figure shows an example of factor analysis for a column of a charge-mould crane. A through fatigue crack about 50 mm long was revealed after 15 years of exploitation. The column was replaced by a new one with a different design. The picture shows an analysis of one factor, namely - maximal stresses. The consideration of this factor and others (number and types of welds, quantity of surfaces, and others) shows certain advantages of structure 2. Calculations were performed by finite element methods . The experts concluded that the lifetime for structure 2 is longer than that for structure 1. The comparative analysis demonstrated the possible failure mechanisms and, consequently, helped prevent them. The methods of fracture mechanics cannot predict lifetimes with guaranteed accuracy. 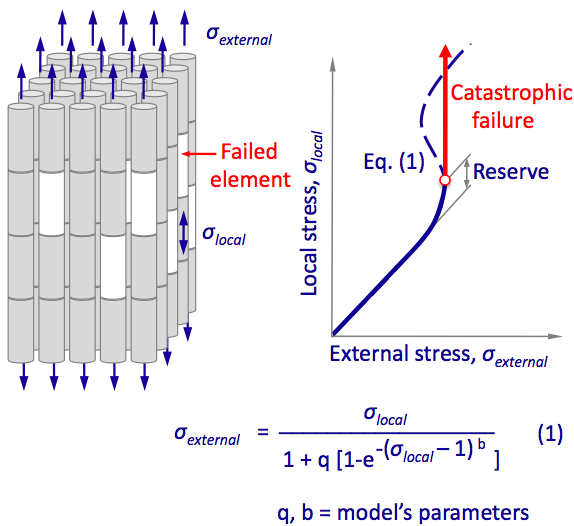 Fracture mechanics concepts help explain failure mechanisms; however, there is no universal model to adequately describe failures in all cases. Failures can include several phases with different determining factors. For example, the scenario of the failure of the main weld balancer (lifting crane) has the following stages: (A) fatigue cracks initiated in a weld that jointed a bulk casting with a thin wall; (B) the transformation of the defects into one semi-elliptic crack, and the propagation of the through crack along the welded seam; (C) the shift of the crack direction from weld into the vertical wall and following growth (D); and (E) final break under static loading when the balancer 'falls down' on the rails. However, the traditional model of the crack growth in an infinite plate is obviously insufficient for this case. Standard specimens are also structures. The characteristics obtained by 'specimens and structures' correspond to the properties of the structures. Any discrepancy in fracture mechanisms, scales, or loading schemes makes it difficult to predict the lifetimes of large-scale weld structures based on the fatigue characteristics obtained from small standard specimens. Designers must take into account the differences between the real structure and the standard specimen-structure. This well-known quotation by R.W.Hamming's  is important when structural integrity is under consideration. This thesis does not deny the use of calculations; they are necessary. However, the evaluations must be accompanied by an evaluation of similarity between the model and real scenario of possible failure. Force lines method  is used in Solid Mechanics for visualization of internal forces in a deformed body. A force line represents graphically the internal force acting within a body across imaginary internal surfaces. The force lines show the maximal internal forces and their directions. The estimation of the strength of new structures considers several possible reasons for failure in different zones. The safety margin ns is the ratio of critical stress to design-basis stress. The CAEF k is the ratio of a parameter (for example, stress intensity factor, stress, or crack length) to its critical value. If the factor is the maximal stress k=1/ns. The CAEF shows the "used" fraction of carrying ability. The carrying ability is completely exhausted when the CAEF reaches one. The safety margin is calculated in terms of stress. The CAEF is used with different parameters such as lifetime, fatigue crack length, and energy deformation parameters [5,8]. Obviously, such routine work is fulfilled by special software . Strength degradation with time increases the probability of failure P of 1,2 and more on n structural elements. The reserve stress of a parallel system depends on number of elements n and its failure probability properties (b is a parameter of failure probability distribution). The reserve ability of a system with parallel elements can be estimated based on the strength probability of its elements. There are 2 types of parallel systems: 1) that in which the failure of one structural element results in the catastrophic failure of the whole system; 2) in which failure of one or more elements does not cause the immediate failure of the system because it still has its reserves. There are a critical number of SEs that define whether the system has reserves or not . A system with a smaller number of parallel elements is characterized by a higher static strength and by the catastrophic failure of the system after the failure of the first element. 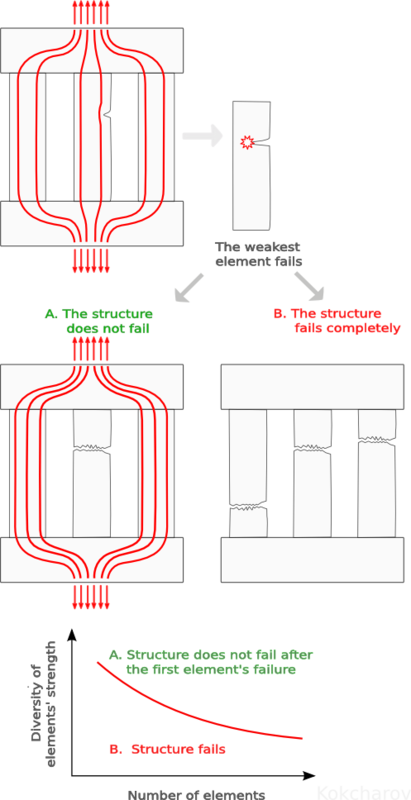 An increase in the number of parallel elements decreases the static strength because of a higher probability of one-element failure, but this prevents the immediate catastrophic failure of the parallel system. The reserve cans reach 10 -В- 20 % in stress. Reserve stress is a numerical characteristic of the reserve ability of a system. This parameter can be used as an additional criterion for choosing a parallel system with redundancy. If the strength degradation rate is known, the analysis can predict the time to the next element failure and the catastrophic failure of the whole system. Hamming R.W. Numerical methods for scientists and engineers. McGraw-Hill, 1962. 411 p.
Koksharov I.I., Burov A.E. Comparative analysis of carrying ability for metalwork units by automated system for strength and crack resistance evaluations. Problemi Prochnosti (Problems of Strength), 1994, No.4, pp. 84 - 88 (In Russian). Koksharov I.I., Burov A.E. Drawing of force lines in solids. Analysis of solutions for plate with a hole or a crack. Preprint of the Computing Center of the USSR Academy of Sciences, No. 6, Krasnoyarsk, 1991, 25 p. (In Russian). Koksharov I.I. Codes for estimation of reliability indices of structural elements. Scientific Siberian,AMSE Press, France, Vol. 11, ser. A (Numerical and Data Analysis), 1994, pp. 83 - 93. Koksharov I.I. Practical application of fracture mechanics methods in CAD systems. Fracture mechanics: Successes and problems. Collection of abstracts ICF-8, Kiev, 1993, Vol. II, p. 519 - 520.